It is always a struggle to find a movie on Pay Per View or a Red Box for "family movie night" that The Favorite Son, my teen daughters will enjoy, and I will, if not enjoy, be able to tolerate. I have certainly appreciated the effort that many studios have made to make kids' films more enjoyable for parents. 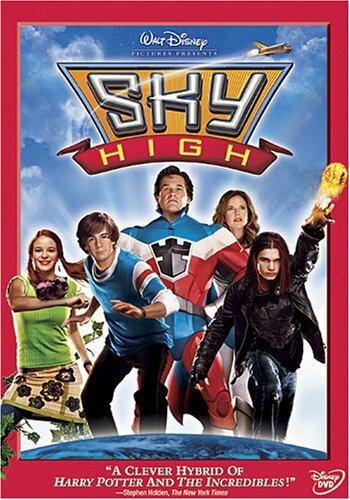 When my younger daughter chose Sky High, I was not terribly optimistic, but Disney actually did a pretty good job making it sort of fun for this GenXer. More importantly, the younger crowd LOVED it. Will Stronghold (Michael Angarano), the son of two superheroes, Commander (Kurt Russell) and Jetstream (Kelly Preston), is about to start high school. Will is not going to just any high school. As the son of superheroes, he will go to Sky High School, where he will follow in is parent's footsteps. However, Will has a secret. He does not have any super powers, so he is relegated to classes for "Sidekick's," and that is obviously a disappointment to his famous father. At Sky High, Will must deal with everything a normal kid must face while growing up, but, through a series of typically teen-age blunders, discovers he must also face his parents' greatest nemesis, Royal Pain (Mary Elizabeth Winstead). The future of Sky High and of the entire world depends on Will. Disney used a lot of great tricks to transcend the generational gap in Sky High. For GenY, some of the costumes, acting, and special effects were very much reminiscent of the wildly popular, live-action, Saturday morning television show, Mighty Morphin Power Rangers. What boy born after 1978 was not secretly in love with the Pink Power Ranger portrayed by Amy Jo Johnson? (Confession: When my little sister watched Power Rangers a couple of decades ago, I was sort of into the Pink Power Ranger myself!) Royal Pain's costume, body movements, secret hideout, and general evil demeanor are a dead-ringer for "Power Rangers" genre. For Gen X, a wonderful little trick that I had not seen before, although I have to imagine it has already been employed, is the use of classic, coming-of-age anthems, like, among others, "I Melt The World," "Save It For Later," "Voices Carry," "Everybody Wants To Rule The World," "And She Was," but had them recorded by contemporary artists. Heck, I think the entire soundtrack is comprised of `80's remakes. (I still think The Talking Heads' version of "And She Was" is superior to that of Keaton Simons, but what would a nine year old care?) For both Baby Boomers and some early GenXers, the casting of Kurt Russell is sort of an interesting bookend to Russell's Disney career. I remember going with my parents to local single screen cinema to see Disney's The Computer Who Wore Tennis Shoes and The World's Strongest Man with Kurt Russell playing the teen-age lead. Appearances by the original television "Superwoman," Linda Carter, as well as Kids in the Hall, Dave Foley and Kevin McDonald go a long way to make Sky High ironically humorous for the adult audience. Nicely done. A film completely appropriate for the younger crowd with just a little cartoonish violence, Sky High is a thumb's up for both kids and parents. This is the kind of movie that made Disney what Disney was. If we see more Sky High's, Disney will be that wholesome, fun, entertainment juggernaut again. The Favorite Son Saga: "Popular Bobby"